I supposed the “optical illusion” disclaimer should’ve been a tip-off, but hey, who paid attention to fine print when the prospect of seeing through unsuspecting people’s clothes was at your nose tip? 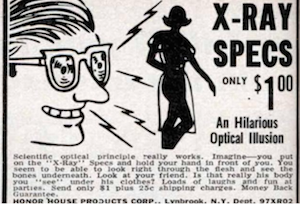 In reality, the Specs weren’t particularly discreet; they were pieces of cardboard printed with red and white hypnotic spirals and the words “X-Ray Vision” where the lenses should have been. Did they work? Well, if you studied your hand long enough against a bright light it kinda sorta looked as if you were seeing a blurry X-ray image, thanks to a feather glued inside each of the cardboard “lenses.”….